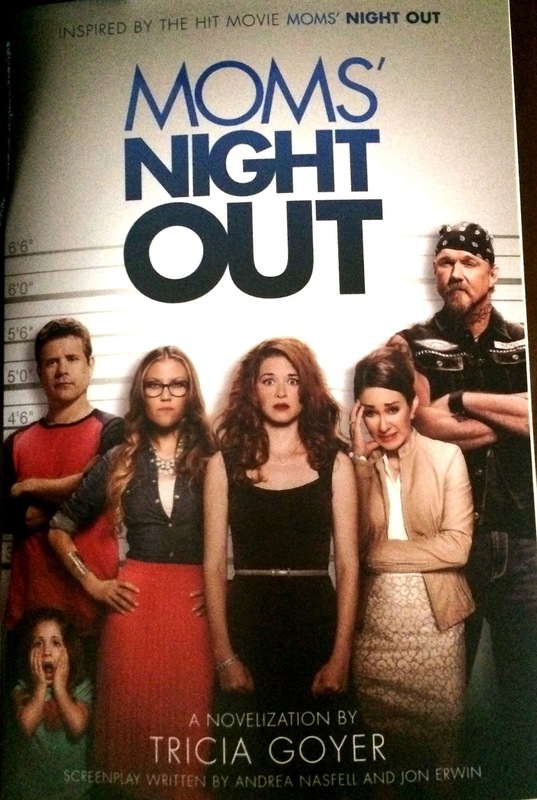 On Mother's Day afternoon, my mom, aunt, husband and I went to see "Moms' Night Out." (Movie website here.) I had already seen the various trailers and interviews, so I had a basic idea of what the movie would be about: a stay at home mom, burnt out and in need of a "free" night that instead of being carefree fun, turns into a crazy night where nothing goes as planned where even her van gets stolen. And the movie was all those things...and so much more. From the moment it began, I felt like the writers had had me under surveillance in order to get their material- I mean come on, the main character's name is even Allyson (though misspelled, so obviously they were just watching my life and not reading my mail or anything, thank goodness). And just to reiterate how much this movie was about my life, my husband looked at me at least 20 times throughout the movie with the, "that-sounds-just-like-you" look. I'm not going to give you the entire plot, but I can relate to many of the scenarios that Allyson finds herself in, like arriving at church with mascara all under my eye (I mean A LOT, not just black flecks)- though I talked to multiple people before I discovered that I looked that way! And I have also had those break downs of exhaustion, even though the house is still not clean, and there are so many things to do, and crying on the shoulder of my husband for not being enough. So in fascination I watched my life (if I had 3 kids) unfold on the screen. But as the movie progressed and the entire theater laughed so loud at the same antics, I realized that, this movie is really about all of us moms. Whether you are a homeschooling mom, a stay-at-home mom, or a mom who works outside of the home- we are all FULL-TIME MOMS! Whether you have 1 kid or five kids. This movie has something for every one of us. The single mom trying to do the best she can, the mother who finds out there is an unplanned (by her) baby in the future, though she already has two toddlers, and even the pastor's wife who hasn't been invited out for a girls night by anyone in five years. Yes, this movie that has been publicized as a comedy is just that. You will laugh and laugh and laugh some more, but you may also cry a little, when you realize that you aren't alone in this crazy world of mommyhood. In fact there is a whole lot of women who face the same self doubts, high stress levels, and everyday struggles that you face. And then you realize that though you aren't a perfect person (because there is only One), you are the perfect person to be the mommy to the children God has chosen specifically for you. AND, did you know there is a book? Yep, Tricia Goyer (Christian author, speaker, mom) was asked to write the novelization of the movie. How cool is that- instead of a movie based on a book, it's a book based on the movie! You can find it on Amazon, or at a Christian store or even Wal*mart! Have any of you seen the movie or read the book? And if you haven't, then what are you waiting for? Grab those girlfriends, moms, aunts (or husbands who will also enjoy it) and go see it- you will be so glad you did! Thank you for sharing about the book. It's a great movie! !! You are so welcome! I've already started it and hopefully I can have some me-mommy time soon, because I can't wait to read it! Thanks for the comment!